Fishing has been decent this past week in Howe Sound. Not a lot of numbers, but there has been some decent size ones to hand if you put your time in. Of course there are the usual undersize to keep you busy in between, so all in all, pretty standard fishing for this time of year. No fresh info from the Gulf Islands this past week, no surprise there as the winds weren’t favorable for a crossing on most days, and with the shorter days most anglers will stick closer to home. The conditions look decent this weekend, at least for the weather. As far as debris in the water, well there is a lot of that, making fishing in some spots not so much fun and at times impossible. This is from the big rains we had that blew out the Squamish River and washed a lot of debris into Howe Sound. That combined with some pretty big high tides has made it a bit of a minefield out there. Keep your head on a swivel when running! As far as gear goes, a variety of Gibbs and Kingfisher spoons have been working well for us on 5-6 foot leaders. 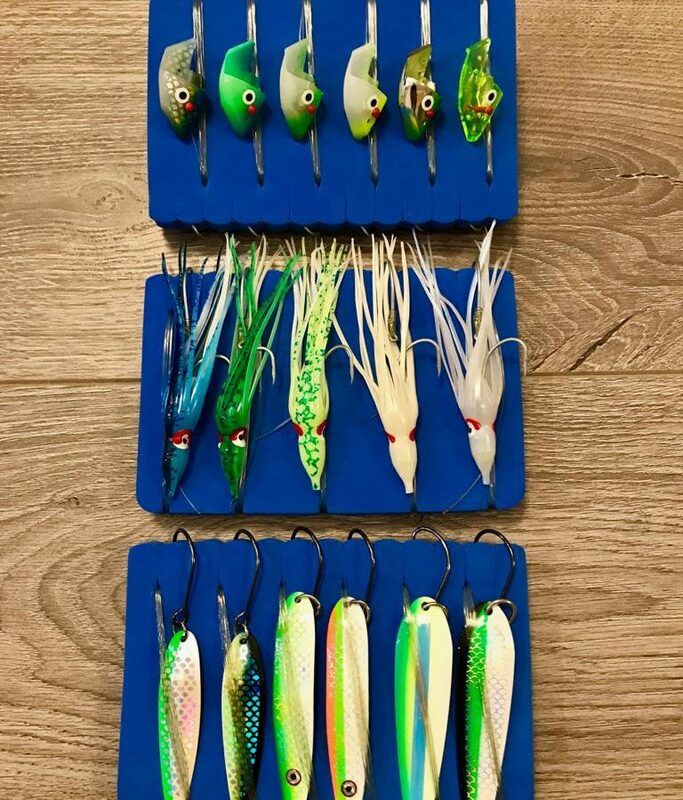 G-Force in 3.0 and 3.5, Kingfisher in 3.0 and 3.5 and Skinny G. Hoothchies and bait will work also, but we are usually fishing spoons on a faster troll this time of year, trying to cover as much water as possible. Here is a picture of some leader boards I tied with some of my most productive teaser heads, hootchies, and spoons. These are your Vancouver salmon fishing essentials! Keep your gear where the bait is, and that means close to bottom with 18 or 20 pound glow cannonballs. Green glow and chartreuse glow flashers are working very well too. Try Lemon Lime, BC, STS, and Chartreuse Phantom. Prawning has been solid, no doubt about that. We have been dropping prawn traps on most of our longer trips. Crabbing is still mediocre. Nothing better than fresh prawns for dinner! See you out there these next couple of days!